An innovative indoor sleeping pod for homeless people has been designed by architects Reed Watts. 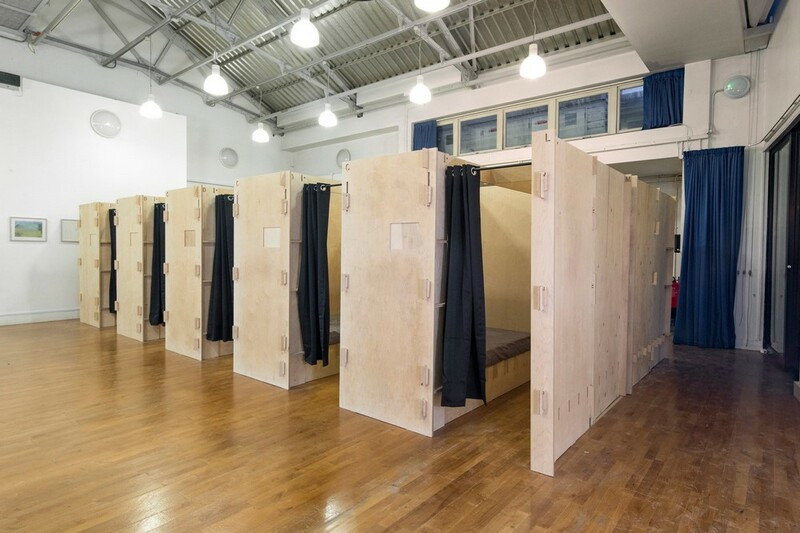 Launching at the 999 Club’s night shelter in Deptford, London the 10 pods deliver private and secure temporary accommodation that can be assembled by hand and is available to everyone under the Creative Commons license. In 2017, an open competition was held by the charity Commonweal Housing, prompted by research into the lives of migrant workers living in tent encampments in London. Reed Watts were selected as the winners as their modular pods met the criteria for a reusable, short-term structure that could be installed in halls and empty and underused buildings. Reed Watts design is made up of a several interlocking, pre-fabricated panels that can be easily stored, moved and assembled by hand without the use of tools. The pods stand 2.1 metres high, 2.1m in length and 1.9m wide, are made of 18mm thick, fireproof birch plywood and have privacy partitions with a raised platform for a mattress that acts as both a bed and a seat as well as storage space for personal belongings. Two of the side panels are shared with the adjacent pod, and a curtain on a rail can further close off the personal space at night-time. A prototype was built earlier this year and tested out at the 999 Club and Housing Justice in Hillingdon, West London. The impact on people using the pods has been very positive. One of the first to benefit was Mark (whose name has been changed), a 48-year-old male with a history of mental illness. He had previously stayed at the night shelter in Hillingdon, but had struggled with its communal nature. The pods, he noted, provided him with a sense of security and having somewhere to return to after work additionally brought a sense of normality to his life. This reminder, coupled with the privacy of the pod, had an aspirational impact on him, reinvigorating his sense of worth, whilst providing him with an additional drive to work towards finding more permanent accommodation. Following feedback from shelter management and guests, the initial model has been refined with its height reduced slightly to make it easier to install, and the raised mattress platform added to create the latest version. To further enhance the accessibility of the project, Reed Watts and Commonweal Housing will release the design on a Creative Commons license so that other organisations, charities and councils can benefit from the pods. Ashley Horsey, Chief Executive of Commonweal Housing said: “We are really excited that the 999 Club is going to be using more pods and we’re looking forward to further assessing the impact they have on people using the shelter. Deptford-based firm Aldworth James & Bond fabricated the panels pro bono, with materials sponsored by Specialised Panel Products. 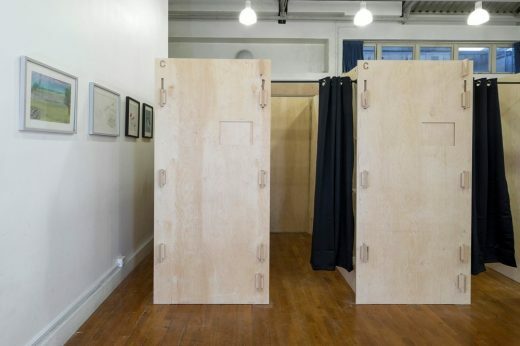 Tim Hill, Creative Director at Aldworth James & Bond, said: “We were thrilled to be approached by Reed Watts Architects for the sleeping pods project at the 999 Club. It was great to have the opportunity to offer our digital fabrication skill for a charity which does such inspiring work in our local community. Designs for the Common Weal Pod are currently being shown at New London Architecture’s Factory-Made Housing exhibition, which runs at The Building Centre, London until 18 January 2019. Reed Watts are a young architectural practice founded by Jim Reed and Matt Watts in 2016, formerly Associate Directors at Haworth Tompkins. The practice has a diverse workload across culture and housing sectors, with completed works at Regent’s Park Open Air Theatre and the V&A. Future and ongoing projects include Shoreditch Town Hall, affordable housing with Pocket Living. new community pavilions in Bushy and Ashtead Parks and a visitor centre for the National Trust. The 999 Club is based in Deptford, in the London borough of Lewisham, and has a 25-year history of working with people who have experienced homelessness. We provide a warm welcome for people who are often ignored, isolated or stigmatised. We empower them to gain the confidence, skills and support needed to transform their lives. Established in 2006, Commonweal Housing is an independent award-winning charity working to investigate, pilot and champion housing-based solutions to social injustice. Aldworth, James & Bond is an award-winning and highly experienced fabrication company offering specialist manufacturing for custom builds and installations. Our focus is on changing the construction industry, whilst delivering projects safely, to programme and within budget for our clients. We are a reliable, creative organization, operating with commercial awareness and team ambition.